Writing, Surviving & Thriving: STEM Fierceness: (Almost) Dr. G! I am really excited about today's STEM Fierceness post. I'd like to highlight a dear friend of mine, Treda Smith Grayson. When I first met Treda years ago, I was totally intrigued by her career path. She works in the field of marine biology and loves all things related to the water. Boy, talk about laughing in the face of stereotypes and myths. Treda is an awesome person and has a brilliant mind. We're not just friends. We are part of the same service organization, SisterMentors, a support group for women of color earning their Ph.D.s. In turn, we, the SisterMentors, mentor girls of color on the weekends. Treda actually called me and told me to watch Dr. Melissa Harris-Perry's show on girls in STEM. She's an awesome woman doing awesome work, and her story is one of tenaciousness, grit, and belief in one's self. Let's learn a bit about her story in her own words. Treda at work in the water. My name is Treda Smith Grayson. I am employed as an Environmental Protection Specialist in the Office of Water at the US Environmental Protection Agency Headquarters. I lead a national program to assess the condition of the nation's estuarine and coastal waters. I have a B.S. in Marine Science with Biology and German minors from Coastal Carolina University, and a M.S. degree in Environmental Sciences and Policy from Johns Hopkins. I am currently pursuing a Ph.D. in Environmental Science and Policy at George Mason University (Fall 2014 will be here before I know it!!!!!). How did you become interested in science? Who were the influential people in your career decisions and interests? I have always loved being around water. Growing up in Central Virginia, my family and I spent a great deal of time fishing, crabbing, boating and recreating in water. I remember our trips to the beach where I would just sit on the beach and dig in the sand to find little animals to keep in my bucket. In school, my favorite lessons were always about the ocean and the Chesapeake Bay. When I was 6 years old, we went on vacation to Monterey and Santa Cruz, California, where we visited the Monterey Bay Aquarium. It was there that I learned more about marine biology and for the first time learned about being a marine biologist. Even then I didn't fully know what a marine biologist actually was, but I knew that it meant working in or near water, and that was what I wanted to do in some fashion. After that, I spent countless hours reading our set of encyclopedias and tucked in a corner of the public library reading about oceans, sea animals, waves, and beaches (Don't Judge Me!). Throughout grade, middle and high school, I pursued my love of all things science and math, and was absolutely elated when I found Coastal Carolina University's (CCU) marine science program. At the time, CCU was one of just a few universities on the east coast (besides several schools in Florida) that offered B.S. programs in Marine Science. I say time and again, going to CCU was one of the best decisions that I ever made. As for those that influenced me most, I would have to say without a doubt my parents. They admit that for a while, they had no idea what I was talking about when I said I wanted to be a marine biologist at such a young age. All they knew is it excited me and they did everything that they could to nurture this eagerness they saw in me. Never once did they try to urge me to go in another direction. They believed in me, supported me, and have been my biggest fans every step of this journey. I will always be grateful and love them for their unwavering support and love. Because I am not in a field cycle at the moment, my typical workday is filled with meetings, meetings to prepare and analyze data collected back in 2010, direct contractor activities and to begin planning for the 2015 field season. During the field season, if I'm not out on a boat sampling with or auditing a state field crew, I'm in the office managing the day to day operations to keep the project running smoothly. The beauty of my job is the opportunity to not be stuck in the office all of the time. I do enjoy those moments out on the water here and there. I think what I love most about my career (especially in the federal government) is that I am able to take my science and policy background and directly apply it to help solve real world science and policy issues. Sure, there are those times when I feel bogged down by the bureaucracy, but I'm constantly interacting with other federal agency and state partners, academicians, consultants and sometimes even policymakers. I have had numerous opportunities to give guest lectures, speak at conferences, and travel the country and the world. I wish that I could say that I have not had to face any challenges as a Black woman in the STEM field, but that would be a lie. The thing I have encountered most is some people assuming that I don't know what I'm talking about because I am a Black female. 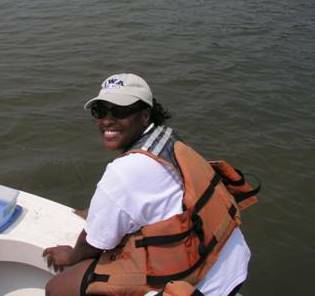 How many Black women do you know in the marine science field, or more broadly in the monitoring and assessment field that I currently work in? I have been fortunate enough to a participant in various programs through the years to recruit, support and encourage people of color to engage in the STEM field. These programs have provided me with a network of colleagues that understand the day to day trials that we collectively face, and it is good to when we come out successfully on the other side. I really like being able to apply my technical background to address science and science policy-related issues. I see myself continuing along this vein, perhaps becoming a senior science advisor either in the federal government, or even on Capitol Hill at some point in my career. Who do you admire in the STEM profession? Those that I admire most in the STEM profession, ironically happen to be in the marine science/oceanography world: Rita Colwell and Sylvia Earle, both of which are legends in the field and charted paths for those of us that come behind them. I must not forget my lifeline of mentors of color that have helped to keep me afloat all of these years:Dr. Deidre Gibson (Hampton University), Dr. Claudia Benitez-Nelson (University of South Carolina), Dr. Ambrose Jearld (NOAA National Marine Fisheries Service) and Dr. Brandon Jones (US EPA). What advice do you have for Black girls who are interested in careers in STEM? I would offer the following advice to Black girls interested in careers in STEM- Be persistent, confident, seek encouraging mentors, most importantly, know that you DO belong in this space, in this field, and in this career. Never believe when someone tells you that you don't belong, as you have as much favor, aptitude, and knowledge as the next person. Impressive, right? I told you all she was awesome. I'm totally inspired by Treda. She's one of my personal heroines. Until next time. . . be fierce, in STEM or wherever you choose to make your mark!